On Saturday 21st June I ran in my first ever Colour Run! I have always wanted to do a Color Run and yesterday I ticked it off! The only challenge involved in this "Challenge" was who would end up being the most colourful! 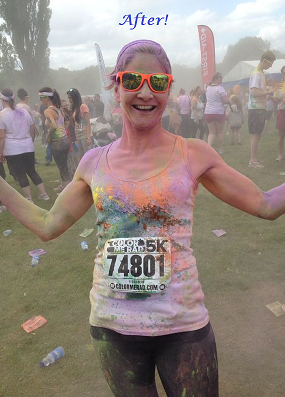 We fully embraced the colour, the excitement and the adrenaline of Color Me Rad in Manchester! This is one of those races that to fully appreciate the experience you must run with a group of friends! I had roped my non running work colleagues into it, and after partially following the couch to 5K training plan they were ready to take on the challenge! There was a group of 10 of us and we were travelling the 70 mile journey from our home town of Kendal to Heaton Park in Manchester in a three vehicle convoy! The only downside to this race was leaving home at 7am on a Saturday morning! We had already received our race pack through the post containing our race number, colourful sunglasses, a RAD tattoo and a finishers T Shirt! I would recommend anyone considering entering this race to opt for a larger size T shirt as they are a little on the small side! As a size 10 I ordered a medium and it is rather snug! We arrived at the Manchester Color Me Rad event at Heaton Park at around 8.15am after a good journey down and easily got parked in the free car park. 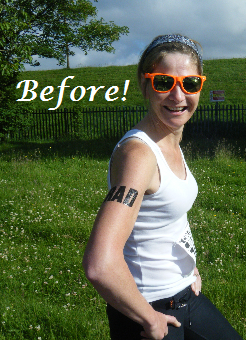 After spending time attaching our race numbers and putting the tattoo on we were ready to go! We walked the short distance to the start line which took us about 10 minutes, and arrived just as the first wave of runners were warming up! Before we knew it it was our turn to get to the start! We were surrounded by a sea of white - perfect for a washing powder advert! After a countdown we were off! We were keen to stick together as a group and desperately tried to keep tabs on each other in the early stages when it was very congested. In no time at all the runners had all disappeared and just the slow joggers and walkers were left! I must admit at this stage of the race I was itching to race but held myself back to stay with my team who weren't running it due to various injuries and ailments! After the first Kilometre we came across our first colour station! I didn't know what to expect as I entered and was caught unawares when a load of pink paint powder was thrown in my face! I very quickly discovered that it was imperative that you kept your mouth shut! As well as the Marshall's throwing powder at the runners there were also boxes of powder for runners to throw at each other! It was like a giant food fight but with paint powder! It was very funny seeing which member of your team could get the most coloured! We were soon back on the track laughing and joking our way to the next colour station where the same fight was reenacted each time but with a different colour! Yellow, purple, blue, green and orange followed!! The 4KM green colour station took us by surprise however, and instead of having paint powder thrown at us we were pelted with COLD liquid paint sprayed out of a pressure washer type machine! There was no opportunity to "fight" with each other at this station, the aim was to get out of there as quickly as possible away from the cold spray! It was back to powder at the finish line as well as all runners being given packets of powder to throw at each other to celebrate finishing! It was a well organised event, the atmosphere was incredible and the weather was perfect! As a runner 5k for me isn’t a particularly long distance, but this event isn’t about the race, the time, the distance or about setting a PB. It’s about running in a beautiful setting having fun whilst being pelted with colour and liquid paint having a good time with friends - and laughing non-stop! To be honest it's the most I have ever laughed during a race and the least I have run! I cannot recommend it enough. It doesn’t matter if you can’t run, most people just walk and laugh their way around the course. It took us 1:14:47 to laugh our way around the 5K route - that's how much fun we had! I think this could probably break the record for the slowest 5K ever! After all the laughter had died down we wearily made our way back to the cars to get our picnic Brunch out! We set out our picnic rugs on the grass and settled down to relive the experience causing us more hilarity! 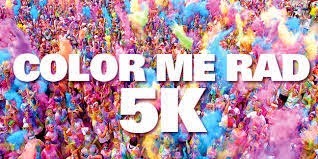 This event is billed as the Happiest 5k on the planet - and I totally agree with this description!! I would definitely recommend doing a colour run and look forward to doing another sometime in the future!